Sail on board the recently refurbished small cruise vessel Monet and experience an eight-day itinerary that features the sights, tastes and sounds of Sicily, and offering guests a complete three-sixty Mediterranean experience. Sicily was settled by Greeks, Romans, Arabs, Normans, Carthaginians and many others, with rugged mountains dominated by Mount Etna, Europe's most active large volcano. Relax in ancient towns and enjoy traditional cuisine influenced by its many inhabitants - there is more than enough to spoil your senses. 21, 28 Sep 2019 departures, subject to availability. Embark on MV Monet between 12.00- 17.00 in Valle a Harbour, dinner will be served on board. 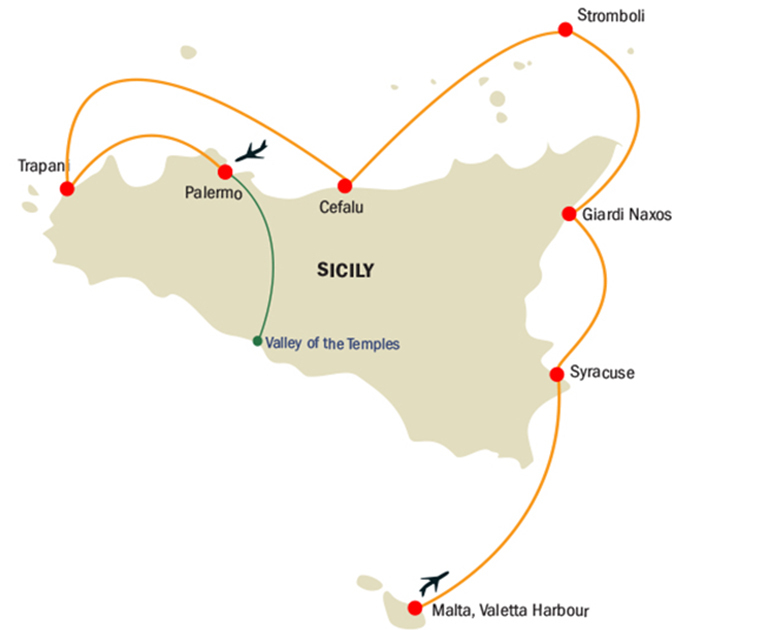 Sail overnight to Sicily. Arrive early in Siracusa. 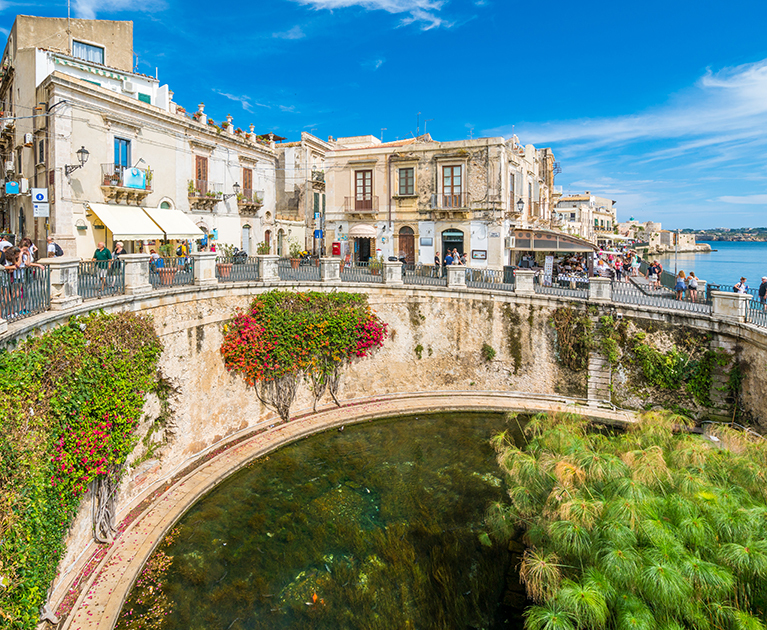 After breakfast on board, head to Noto, the centre of Sicilian Baroque architecture, a treasure chest brimming with baroque churches and palaces. You will stop on the way at a special cafe to try some special Sicilian sweet – Granita. The cafe is set in an old nougat factory but is now the home of a famous craftsman. Next, head to a winery set among a spectacular landscape. The beautiful setting of the vineyard amongst limestone hills, combined with the sea breeze drifting in from 2 different seas helps create superb conditions for the vines to grow and to produce some great wines. Here, Nero d’Avola and Moscato grow together as well as almonds, carobs and olives. After indulging in a little wine tasting, you’ll take lunch in one of the old wine cellars or have a picnic of some local delicacies in the shade of carob trees. In the afternoon you will meet a local guide for a short tour of the beautiful city of Siracusa, and Ortigia, the old centre. The huge Roman amphitheatre was originally constructed around 2000 years ago and is the second largest in Italy. The cathedral and the Archbishop’s Palace dominate the beautiful square at the centre of the old town and you can wander the tiny streets, visit some of the historical sites or just enjoy the views and a coffee. Visit Fonte of Arethusa, a ‘mythical spring-fed fountain’; the Temple of Apollo, a 7th century BC site that was the first great Doric temple and the beautiful baroque Duomo dedicated to St. Lucy who was born and martyred here. Also, visit the ‘Parco Archeologico della Neapolis’ and its huge Greek theatre that still stages performances and the Roman amphitheatre before you head back to the ship. Sail to Giardi Naxos overnight – You are free to eat on board or try one of the many local restaurants before you sail. Dock in Giardi Naxos for a busy day – the gateway to Mt Etna and beautiful Taormina. start your day on the slopes of Mt Etna with a quick visit to a local family honey farm to try some honey (orange, lemon, eucalyptus), as well as almond pastries, olives and olive oil. Continue to a wine estate some 700 metres above sea level that has belonged to the same family since 1727 – they provide some fine wines. Enjoy a guided visit and a lunch of Etna’s local cuisine and wines. current Baron, who will happily tell you all about the villa. to 1-2 of the craters. Head back to the ship for dinner and sail overnight to Stromboli. Arrive in Panarea early in the morning. Panarea is the remains of an extinct volcano and the second smallest of the Aeolian Islands, with a population of fewer than 300 people, but it comes alive in summer. It is a beautiful little island and stop here to explore and try the cafes. Continue to Stromboli for a couple of hours free time and to view the eruptions during the evening from your vessel. Stromboli is an active volcano that rises nearly 1000 metres from the sea and is usually in a state of constant but mild activity. There are three small villages on Stromboli but very few facilities. Stromboli is one of the most active volcanoes in the world. this beautiful old coastal town is set against the backdrop of a towering rock topped off by a Norman fortress. The narrow streets lead to some fine beaches, the ancient washing pools where the ladies of the town would wash clothes a thousand years ago, and a glorious cathedral. Cruise will anchor in the new harbour, a 10-minute walk from the old town, and the highlight will be a picnic served in the Norman fortress, a thirty-minute walk up the hill from the town. There are plenty of options if you would rather stay in the town. Those wishing to join in will be divided into small teams and will be given an instant camera and a booklet, including a map. Each team will take photos of certain points of interest, some easy to find and others more difficult. This unusual way to explore will take you to (hopefully) the Norman Duomo, started in the time of Roger II in 1131, with precious mosaics that adorn a renowned and striking image of Christ. You will also visit the Jewish ghetto, the ancient Postierla gate built into Megalithic walls and the striking mediaeval wash-house. For many, the highlight of the day will be a guided walk up the slopes of the “Rocca” with your guide – a great vantage spot a fine spot for a picnic from where you can take wonderful photos of the labyrinthine city. After lunch, head back into the old town for a refreshing granita or drink while relaxing in the Duomo square in front of the Unesco monument. Dinner will be provided on board and leave Cefalu in the evening and cruise overnight to Trapani. In Trapani, a small but active fishing village with a few cafes overlooking the harbour. From Trapani, take an excursion to Erice set spectacularly 2500 feet above sea level, from where you can see Africa on a clear day! This ancient town was taken over by the Normans in the 12th Century and heavily fortified. Famous in antiquity for its temples where the Phoenicians worshipped Astarte, the Greeks venerated Aphrodite and the Romans celebrated Venus. Erice claims to be the best preserved mediaeval town in the world, rich in castles and churches. Enjoy a breathtaking view from the hilltop from where you might glimpse the distant shores of Africa. Stop in a historical pastry shop in Erice to learn about the tradition of Dolci Siciliani, made by nuns, and will sample their wares. Have a typical Lunch in an olive oil farm under olive trees, and an olive-oil tasting. Make a short stop at another famous winery to look at methods of bottling. In the late afternoon, head to the coast – characterised by an unusual landscape peculiar to this part of Sicily – saltpans. Large mirrors of saltwater form an irregular and multicoloured chessboard, dotted with windmills that were used to pump water and grind salt. Stop at the Stagnone Nature Reserve, home to flamingos, for an aperitif overlooking the saltpans – A charming place at sunset with colours that shift from red to orange to pink, encircling the ancient mills and the silhouettes of the Egadi Islands. Wake up in Palermo, the spectacular capital of Sicily. Cars, vans and thousands of scooters vie for space in the narrow streets, horns blaring, while trying to force themselves into impossible gaps. It will take a 3 hour “Street food” walking tour of Palermo – led by a local expert guide, sample the best of Sicily’s street food and the fascinating culinary world of Sicily’s Capital. You will visit the famous and bustling Mercato del Capo tasting five different Sicilian treats including “panelle” (chickpea fritters) and arancine (deep-fried rice balls). Once you have enjoyed the vast array of products you have the opportunity to learn what to do with it. Your chef will host a hands-on cooking class in a restaurant followed by lunch. The dishes you’ve prepared will be served with just the right Sicilian wine, and dessert accompanied by local biscotti and Sicilian dessert wine. Advertised prices are person twin share, land only, correct at time of publication and are subject to availability and change at any time without notification due to fluctuations in charges, taxes and currency. Offers valid on new bookings only. ^Bonus is included in the advertised price. Other conditions apply. Please contact your personal travel manager for full terms and conditions.